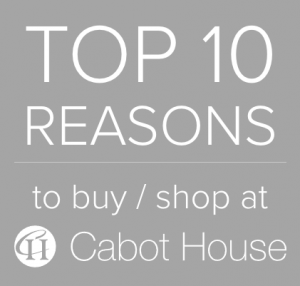 Cabot House offers the finest quality and value in home furnishings including Living Rooms, Dining Rooms, Bedrooms, Home Theater, Entertainment Centers, Home Office, Outdoor Furniture and Accessories. Pam Miller is an incredibly talented designer who makes the process enjoyable. She pays attention to all the details and special touches. She translated my style into the prefect pieces for my homes in MA and NH – two very different spots. Pam coordinated the fabrics, furniture, rugs, lamps, and drapes to create a perfectly finished look that matched my family’s lifestyle. It has been a pleasure working with Jason. His attention to detail, honest suggestions and the effort to get the best for our house are the reasons I will recommend him! We worked with one of the Cabot House designers, Melanie, to decorate our vacation home. She was fabulous! Melanie met with us to discuss our furnishing needs and walked us around the showroom to get a sense for our style. The next time we met she had numerous beautiful options for us to choose from. Cabot House has a huge number of manufacturers and they were very flexible with customizing our pieces. We had many communications through the spring over details and Melanie was very responsive and easy to work with. From the beginning stage of brainstorming our interior design to the end stage of delivery, our experience with Cabot Furniture was a real pleasure. Elegance and style are what makes Cabot House number one! The sofa is beautiful. The fabric works perfectly in the room. I really like the look and the quality is outstanding. And, it’s very comfortable. Your delivery people were terrific…Pure excellence in customer service throughout and I’m so appreciative.